Online play, sometimes known as netplay, is the act of playing games in the Super Smash Bros. series with other players via the Internet. Thus far, Super Smash Bros. Brawl, both versions of Super Smash Bros. 4, and Super Smash Bros. Ultimate have had netplay officially supported by Nintendo; while released without native netplay capabilities, modern methods exist for playing both Smash 64 and Melee online. The Nintendo 64 does not natively support online play, though the idea was explored as part of the 64DD add-on. As such, online play for Smash 64 is accomplished through the use of emulators, such as Project64k. Owing to the lower system requirements of Nintendo 64 emulators and the rather fragmented community surrounding Smash 64, netplay is among the most common ways to play the game in the current scene. Initially, netplay was achieved via servers such as Smash FU and The Galaxy, but the community has since changed to mostly using peer-to-peer connections. While the Nintendo GameCube does have limited support for internet connectivity with appropriate adapters, Melee was released prior to the official release of these adapters, and as such, it does not natively support online play. Like Smash 64, online play for Melee is generally accomplished through emulators, particularly Dolphin. Prior to Dolphin featuring netplay functionality, experimental online play was previously performed by a variety of tunneling softwares that could directly connect GameCube consoles to one another, such as via XLink Kai or exploits in Phantasy Star Online for the GameCube. These methods, however, were difficult to set up, required extensive knowledge of the software on hand and networking protocols, and required both players to be using the same version of Melee. Matches themselves often had desyncs, with items notably being implicated. Online play later experienced mainstream popularity with the GameCube and Wii emulator Dolphin, which allowed for considerably easier connectivity between players, as well as being considerably more reliable in terms of synchronisation. Initially holding only niche popularity due to Dolphin's high system requirements, the gradually increasing power of personal computers and improvements to Dolphin's performance has allowed for more Melee players to partake in online play. The "With Anyone" menu from Brawl. The Nintendo Wii was the first Nintendo console to focus on online gaming, with Nintendo allowing the device to take advantage of the Nintendo Wi-Fi Connection. 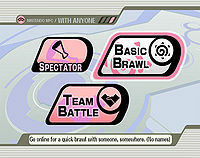 As a result, Brawl was the first game in the series to officially support online play, allowing players to fight against either strangers or friends. In addition, gameplay mods for Brawl could also be unofficially played online via this protocol, though all players would need the mod in order to prevent desyncs from occurring. Official support for online play in Brawl was ended on 20 May 2014. A variety of methods, however, still allow for Brawl to be played online; Canadian smasher pidgezero_one developed a method to play Brawl and Brawl gameplay mods via the Wii, and Dolphin also supports online play via the computer. The With Anyone menu in Smash 4 on Wii U. Like Brawl, both Super Smash Bros. for Wii U and Super Smash Bros. for Nintendo 3DS natively support online play, though this time, the service is provided via the Nintendo Network. The service also offers a variety of benefits over Brawl's online play, particularly in regards to options and matchmaking. The overall concept, however, remains the same, with players being able to play against either strangers or friends via the internet. Currently, there are no methods to play Smash 4 online outside of the Nintendo Network; that said, Citra and CEMU, experimental emulators for the 3DS and Wii U respectively, could potentially see online play occur on personal computers like previous games in the series. Ultimate has native online support much like Brawl and Smash 4. However, this time online play is a paid service as part of Nintendo Switch Online. Rather than selecting from modes with specific rules, players can now choose their own preferred rules and the game will attempt to match players with similar desires. Compared to previous games, Ultimate allows for a wider selection of rules when playing with anyone. Upon opening the Online Submenu, the player is greeted with two choices, Smash or Spectate. Upon choosing Smash, there are three options to choose from. Quickplay, Battle Arenas and Background Matchmaking. Quickplay has the player select Solo or Co-op (local), with a Preferred Rules switch underneath the two options. Players can battle in three different formats: Free-For-All, Team Battle (2-on-2), or 1-on-1. These battles can be played on all stages, with or without stage hazards or in Battlefield or Ω Forms. Items can be toggled, though the only ones that are directly toggled are the: Smash Ball, Assist Trophy, Poké/Master Ball, Dragoon/Daybreak pieces, and Special Flag. All other items are relegated to the "Other" toggle. Three battle types are playable online: Time, Stock and Stamina. Time allows for matches with the times 2:00, 2:30, and 3:00. Stock allows for matches lasting 3:00, 4:00, 5:00, 6:00 or 7:00, with 1, 2 or 3 stocks. Stamina allows for Stock matches with each stock having 100, 150, 200, 250, 300 Stamina. Upon choosing Solo or Co-op, the player(s) can choose their character(s), and are taken to the Online Practice Stage, which takes the form of Battlefield. There they can train with CPU Partner(s) while waiting for opponent(s). If the player(s) choose Background Matchmaking, they can choose Solo or Co-op, their fighters and preferred rules. While waiting for their opponent(s), they can participate in various different modes. Battle Arenas are a new form of online play for the series, being able to make it visible for all (Public), or for Friends only. Arenas can have a password set, preventing unauthorized players from entering. The type can also be set, for All Skill Levels, Veteran Players, Glorious Smashers, Anything Goes, or Playground. The formats can be set for Four Player, Three Player, 1-on-1, and Team Battle. The rules are set from the player's own rulesets, though limitations apply. The time for any match has a max of 10:00, the stocks for matches cap out at 7, and the max Stamina for matches is 300. The Rotation format is Winner/Loser leaves the ring. Pressing Y or the left button on a Joy-Con will show more options. The minimum amount of players in a Battle Arena is 2, and the maximum amount is 8. The Stage selection can be set to Choice, Random, Random Battlefield, or Random Ω Form. Spirits can be turned on or off. Voice Chat can be turned on or off, and Voice Chat is made possible through the Nintendo Switch Online app. The Room Music can be set from the "More Settings" menu. The music can be set to anything accessible in My Sounds. Upon creating/entering a Battle Arena, the announcer will say, "Step into the ring." The player can then choose their Preferred Fighter and Preferred Stage (granted the Stage Selection is set to Choice). The player has a token, which they can pick up and move around with their hand cursor. They can place it into the Waiting Area, better known as "The Line," and wait to play a match. If nobody is in The Ring, a player can place their token in the ring and begin a match. People who want to watch the fight can go to the Spectator Stands, where they can spectate an ongoing fight. Upon the specified number of players joining, any of the players in The Ring can press Start, + or - to allow the other players to ready up. Pressing A or the right Joy-Con button, the player will ready up. Once all players are ready, they will begin a fight. If a player does not ready up within 15 seconds, they will be sent back out, and will be placed in the area where one would be placed automatically upon selecting their stage or character. There are plans to make another game-specific service for the Nintendo Switch Online app, called Smash World. It has been given a release window of 2019. It has been said that it will be a way to view replays online, like the replay service in Super Smash Bros. for 3DS/WiiU, but anywhere. This page was last edited on February 18, 2019, at 16:55.